1. Children's clubs such as STEM clubs, STEAM clubs, cubs, brownies and after-school clubs. 2. Childcare schemes such as playschemes and summer camps. 3. Clubs for adults, such as STEM clubs, STEAM clubs, self study groups and pensioners' clubs. Educators who are working with the children's clubs and childcare schemes are helped by the fact that often a significant proportion of the children will already have used K'NEX at school or at home, and will be able to help other children who are new to K'NEX to get started. 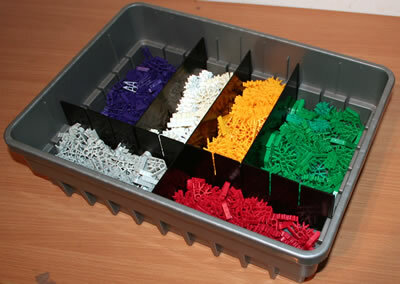 K'NEX is popular with children's clubs and childcare schemes because of its relatively low cost, and its versatility. Children of any age from 5 upwards will find themselves enjoying using K'NEX once they overcome any initial nervousness. 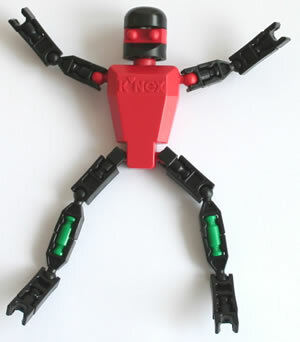 There is also a version with bigger components available called Kid K'NEX, for children aged 3 to 7. Our K'NEX shop provides details of the many K'NEX education sets that are ideal for children's clubs and childcare schemes. These sets are much larger and better value than the K'NEX sets you can buy in the shops. The sets include general-purpose sets (such as the "Discovery Building" Set) and Curriculum sets (such as the "Exploring Machines" sets). 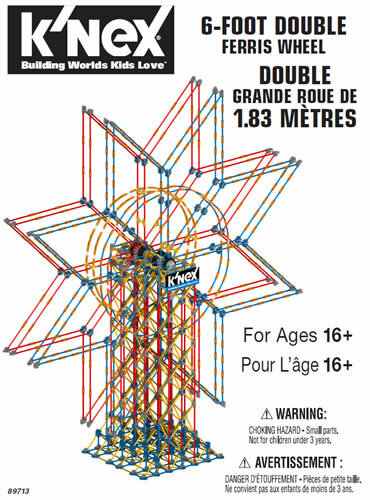 ♦ You might like to introduce K'NEX to your club members by asking them to build a few K'NEX models from instructions. Once they have become familiar with K'NEX-building techniques, it is then recommended that you move on to setting them K'NEX Challenges, so as to maximise the educational benefits. ♦ We would suggest you put your club members into groups of 2, 3 or 4 to use K'NEX. This will help them to develop teamwork skills and communication skills whilst they are completing their K'NEX projects. ♦ If your club offers some form of certification to members (eg badges for cubs and brownies), consider whether K'NEX can play a part in helping Club members complete the work to achieve that certification. ♦ You may find that some of your club members become better at using K'NEX than you are yourself, in a similar way that schools often have computer whizz-kids that are ahead of their teachers. Do not worry about this! We suggest you put your star members to work helping out those members who are taking longer to master the K'NEX building skills. ♦ Once you and your club members have mastered following the instructions for the K'NEX models in the teachers' guide, you may want to think about starting to use K'NEX challenges. This will help you to get even more value out of your investment in K'NEX. 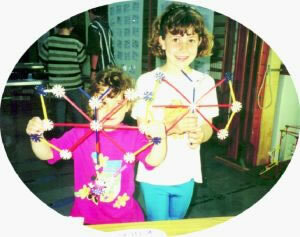 ♦ Think about advertising in advance when you are going to do a K'NEX project in your club. Clubs often find they get more members attending a session if they know they are going to be working with K'NEX. 1. At regular meetings of the Club. 2. Within the Club's summer playscheme. The challenges used at Club meetings each lasted about 45 minutes. All club members took part, with ages ranging from 5 to 11. The objective of the challenge was explained to the children verbally, and they then worked in pairs to complete it. A member of staff was available to help any children in learning to use K'NEX, and in solving any problems that they might encounter in completing the challenge. Older children were also encouraged to help the younger children. A rather different approach was taken in the playscheme, held in the local primary school. Here, K'NEX challenges were provided at regular intervals throughout the week, alongside other activities such as sports, arts, crafts and story-telling. In dry weather, the challenges were completed in a shaded outside area, and in wet weather, in a classroom. Children chose to participate in the K'NEX challenge as and when they liked, in groups of two or more. Often after completing the challenge, the children would devise new K'NEX challenges of their own, and then work happily together on them for long periods. In both the Club and Playscheme settings, girls and boys of all ages enjoyed the challenges, and parents commented that they often wanted to continue their K'NEX-building at home. A number of the children taking part in the Club meetings and playschemes had learning difficulties. Once they had mastered the basic techniques of joining K'NEX rods and connectors, they too enjoyed the K'NEX challenges, and in some cases proved to be very capable K'NEX builders.